Stained Glass, Carved Oak Woodwork, Beautiful Fireplaces, Parquet Floors, Ornamental Plaster, Lovely Chandeliers. 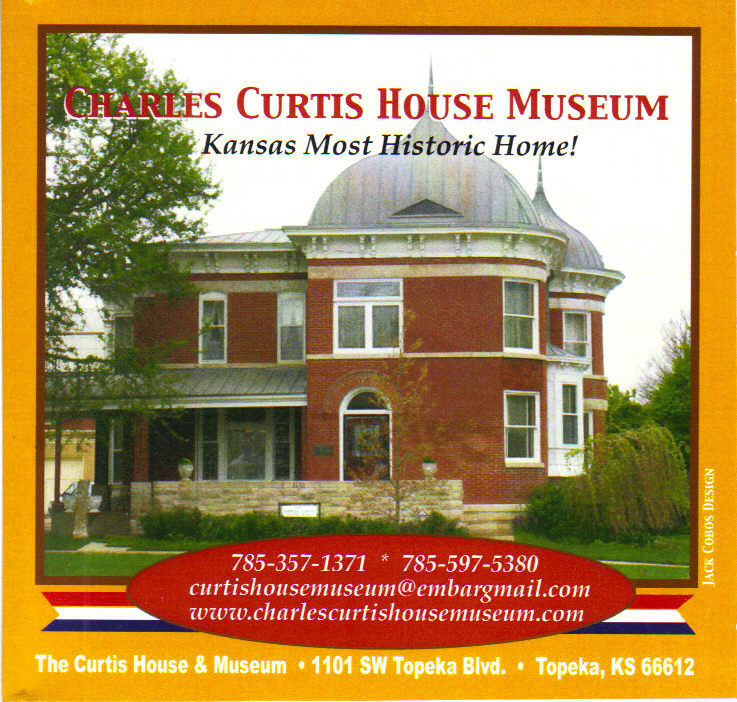 Listed on the National and State Register of Historic Places and Topeka Landmarks Register, the Charles Curtis House Museum is located at 1101 SW Topeka Blvd, Topeka, Kansas. Visitors have easy access to the Museum using Interstate 70 and taking Exit 361A for Topeka Blvd and going south, or by taking Exit 362A for 10th Street and going west to Topeka Blvd. The brick mansion sits on the corner of 10th & Topeka Blvd., SW of the Kansas capitol. Learn about a Fascinating Statesman! A limited edition (200 copies) new release of the 1928 book, "From Kaw Teepee to Capitol" by Don Seitz has been published by the Cottrell's with an added intro- duction and addendum written by Nova Cottrell, whose life mission has been to preserve the home and the history of this great Kansan. This 130-page hardback book with dust-cover, printed on premium glossy paper with both color and black & white photographs, is sure to become a collector's item. The book was published for the Kansas Sesquicentennial and sells for $49.95. Proceeds go towards the preservation of the Charles Curtis home. Charles Curtis, was a great-grandson of a Kanza Indian Chief, his mother being Native American. Curtis was born January 25, 1860 to Captain and Mrs. Oren Curtis. His mother died when Charles was three, and his mother's people raised him on the Kaw Indian Reservation. Curtis served in the U. S. House of Representatives for sixteen years from 1893 to 1907. He was elected Senator in 1906 and served from 1907-1913, and again from 1915 to 1929. When Charles Curtis was selected by President Herbert Hoover to serve as his Vice President, Curtis became the first Native American to hold the office, the first Vice President to come from west of the Mississippi, and the first Vice President from the state of Kansas. The Charles Curtis State Office Building, at 10th Street and Jackson, was dedicated in his honor in 2001. Other sites of interest to visitors are the Charles Curtis Greenway on North Topeka Blvd. and the Curtis Burial Plot in Topeka Cemetery, also on 10th Street.